This weeks fabulous sketch at Freshly Made Sketches has been designed by my wonderfully talented friend from the other side of the world, Jen Brum. Another Christmas card? Why not? You just never know when you’re going to be surprised with card you didn’t expect to receive. Joyous Noel Speciality Designer Series Paper is one gorgeous pack. I didn’t expect to love it as much as I do and now I am almost running out of it. I really should’ve purchased two…. Both the pretty rectangles of DSP are from this pack. I added sprigs punched in Tranquil Tide Cardstock and Vellum. 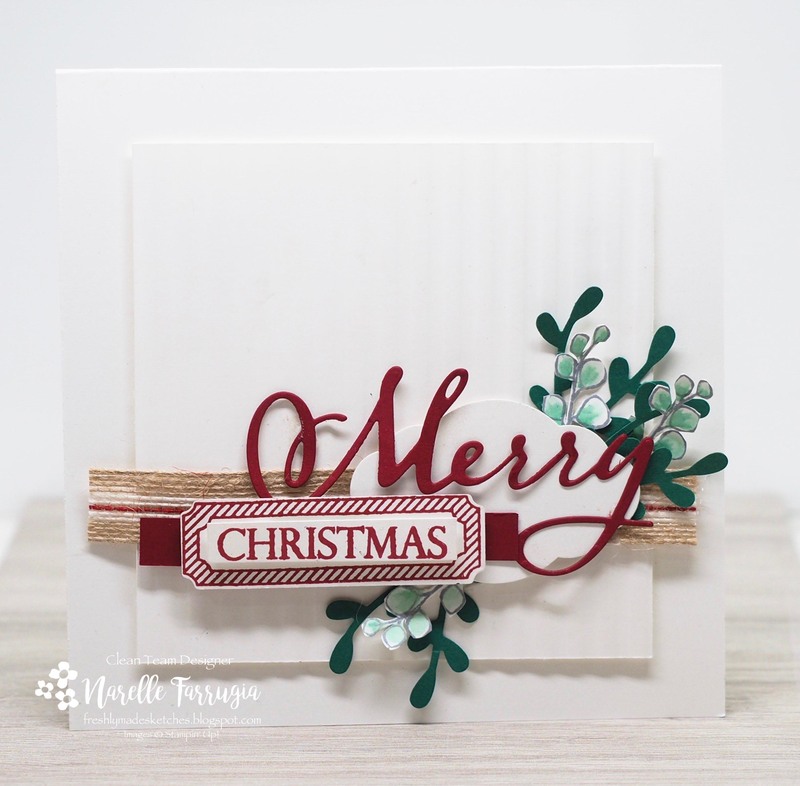 I layered my sentiment, from Merry Christmas To All, on a piece of Sahara Sand Cardstock punched with my Darling Label Punch. I then added a strip of Striped Burlap Trim and some Linen Thread looped behind everything. The team have created gorgeous inspiration for you – head over to Freshly Made Sketches and see what they’ve created. 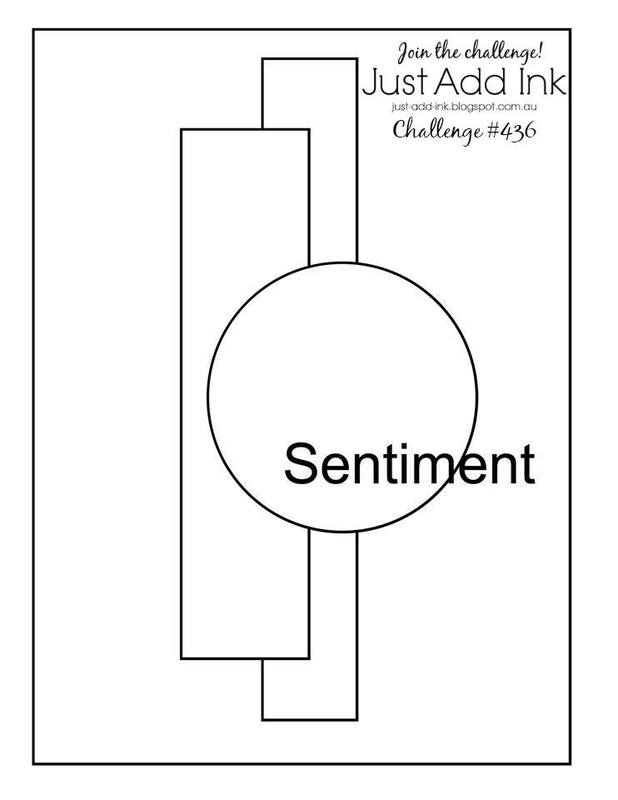 It’s time for a new challenge at Colour INKspiration Challenges. 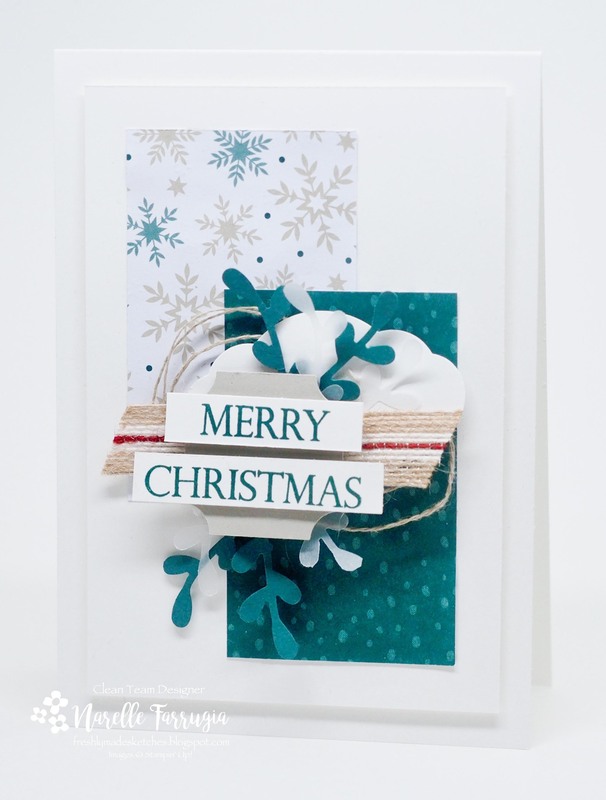 To see what everyone is making and to link up your card to our facebook page – click here. 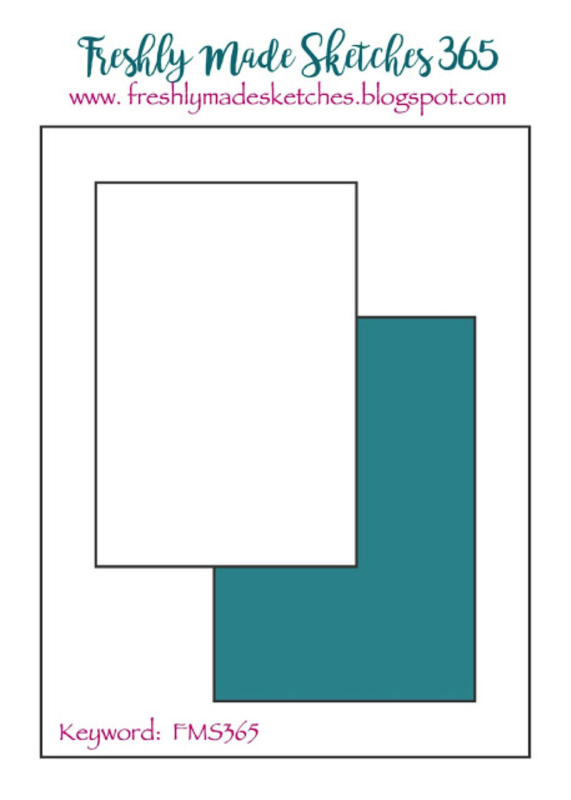 This week the challenge for you is to create a project using 1, 2, 3, 4 or all 5 of the 2017-2019 In Colours. Easy peasy! The challenge I gave myself was to create a Christmas card using colours from the 5 above. In the end I chose 2 of them – Tranquil Tide and Powder Pink. 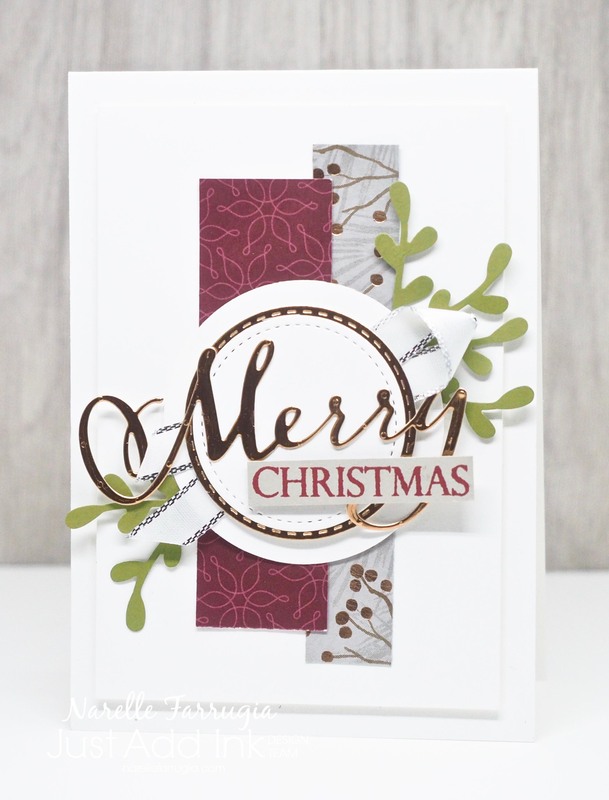 I only had one lot of stamping on this card – the “Christmas” sentiment from Merry Christmas To All. I really do love this sentiment paired with the “Merry” Thinlit from Merry Christmas Thinlits Dies. I then went to town cutting pine leaves from Pretty Pines Thinlits Dies in a combination of Tranquil Tide and Powder Pink Cardstocks. The designer series paper layered in the background is from Joyous Noel Specialty DSP. I then added a strip of Whisper White Cardstock embossed with Swirls and Curls Textured Impressions Embossing Folder. As always, we have a blog hop to showcase our designs. The next hop along the way is the super creative Tanya Bell. You can click below to take you to see her amazing creation. New goodies arrived on my doorstep the other day. I knew they arrived because my Ring Doorbell System showed me that the delivery man rang my doorbell. I actually got so excited, I screenshot it….. I’m ignoring the fact that this is probably considered stalking by many people, but I was just so happy to see that big brown box! The box arrived in time for our newest sketch at Freshly Made Sketches. This fabulous sketch has been designed by Jen Mitchell. Jen’s use of colours and perfect stamp choices had me at hello long before I joined the Clean Team. This post coincides with the 2018 Stampin’ Up! Holiday Catalogue going live today. Many of the products I’ve used on my card can be purchased from this Catalogue. I really love a sentiment die combined with a stamped sentiment. I can see the amazing sentiments I’ve used on my card will be worn out before Christmas as they are the perfect font and perfect size for my cards. 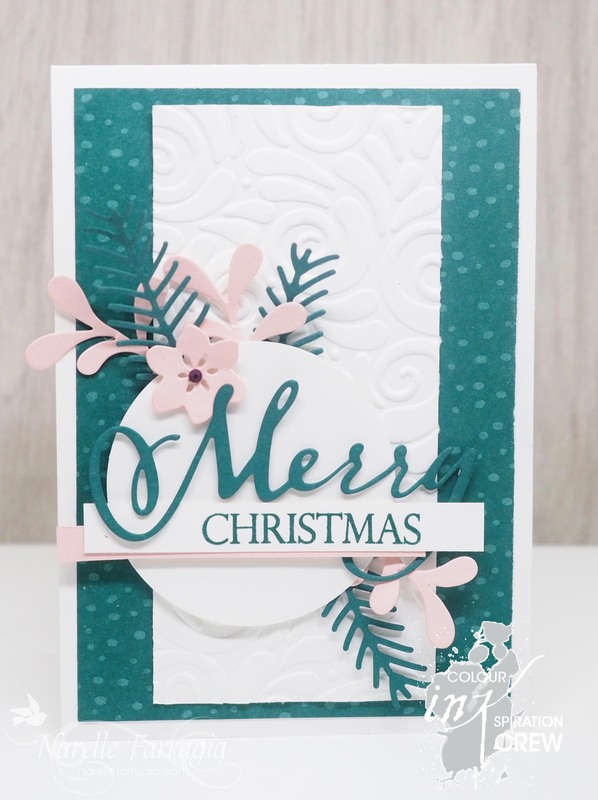 The thinlits and stamp set are from a bundle called Merry Christmas To All Bundle – these were the first to go on my wish list. I’ve stamped with Cherry Cobbler Ink and used the matching Cherry Cobbler Cardstock. The yummy Striped Burlap Trim I’ve layered under my sentiment is also from the new catalogue. To give a bit of definition to the background on my card I also used my new Corrugated Dynamic Textured Impressions Embossing Folder. Another must on my wish list was the Peaceful Noel Bundle. This consists of the Peaceful Noel Stamp Set and Sprig Punch. I’ve punched a few sprigs and also stamped a sprig from the stamp set and gave it a quick watercolour – it was only after I’d coloured my sprigs, did I realise this set is a two step stamp set and the set comes with a stamp to colour the centre…..oh well, they only took a few mins to colour. The team have created awesome cards. If you’d like to see them and be inspired by what they’ve created, head over to Freshly Made Sketches.